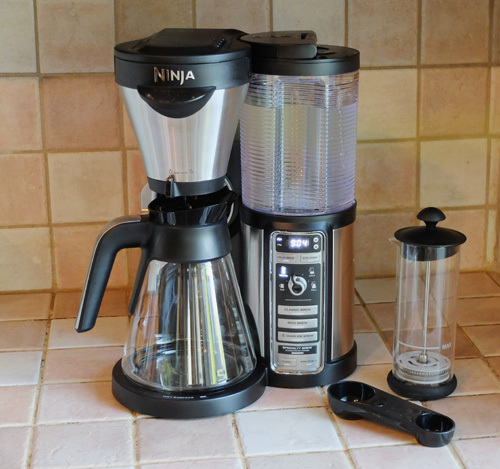 The Ninja Coffee Bar – Possibly the only coffee machine you’ll ever need. In a hurry to get your hands on one? you can buy the Ninja Coffee Bar through Amazon.com. It used to be that everyone was happy with a simple drip brewer, a French press or a percolator. Whichever method you preferred, you’d get a decent cup of coffee each morning. Then we were tempted by single-serve coffee makers. They’re super convenient, but you pay a lot more per cup of coffee. And then...well...wouldn’t it be nice to have an espresso machine as well? That way you could make a latte or cappuccino like the ones you buy at Starbucks. If you have a ton of counter space and a hefty budget, you can buy yourself a regular brewer, a single-serve brewer and an espresso machine. Otherwise you have to make a tough choice, and choose one out of three. This is the problem the Ninja Coffee Bar seeks to solve. It is being presented as a single machine that does it all. It makes coffee by the carafe, or just enough for a single cup or travel mug. And it makes a concentrated coffee you can use to make an espresso-style drink like a latte or cappuccino. Which is interesting, because this brewer is, at heart, a drip brewer. But a drip brewer with a lot of different options. First, making coffee by the carafe. 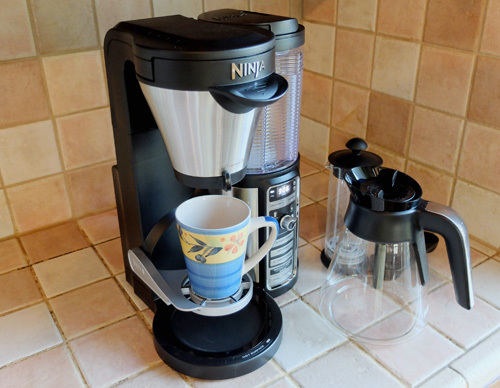 The Ninja Coffee Bar has a couple of settings for this – one for a full carafe and one for a half carafe. You turn the dial on the front to the full or half carafe setting, and then add the appropriate amount of ground coffee to the filter basket. The volume of water drawn from the reservoir is automated. Another setting allows you to choose between a regular strength coffee, which they call Classic, and a stronger, bolder brew which they call Rich. The control panel on the Ninja Coffee Bar brewer. Second, make coffee one cup at a time. There are two settings you can choose from. One for a regular coffee cup or mug, and one for a travel mug. Again, you can choose between a Classic or Rich brew. The process is the same for making a carafe of coffee. After turning the dial to the setting you want, the brewer will automatic draw the exact right amount of water from the reservoir. And using the scoop supplied, you add enough ground coffee to the filter basket for the size of the mug or travel mug you are using. In other words, you can use the Ninja Coffee Bar as a single-serve brewer. Granted, it’s not quite as convenient as using a machine with K-Cups, discs or capsule. But the only extra work involved is to scoop some coffee into the filter. This a single-serve brewer that requires a little extra work, but will save you a ton of money on the price per cup. Third, you can make an espresso-like coffee concentrate. This is where true coffee geeks with throw up their arms in horror. 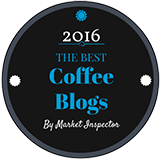 They’ll tell you that a true expresso can only be made with an espresso machine. And that a true latte or cappuccino can only be made with an espresso from one of those machines. And they’d be right. The Ninja Coffee Bar doesn’t make a real espresso. But by adjusting the proportion of water to ground coffee, it does make a concentrated brew that can be used as the base for a latte or cappuccino style drink. This is the part of the Ninja Coffee Bar story that had me the most curious. That’s why I demo this option in the video. I was more than a little suspicious about their claims. That said, I have made lattes in the past using a stovetop Bialetti brewer. And that doesn’t make “real” espresso either. So I had an open mind. Anyway, as you will have seen in the video, my latte-style drink was really pretty good. Whether you’ll agree with me depends on your mindset. If you come to it thinking, “This can’t be right, because it’s not made with real espresso”, you’ll probably be disappointed. But if you come to it thinking, “Never mind the process, let me just see if this tastes good”, you’ll probably agree with me. One nice touch is that the machine comes with a manual milk frother. I had never used one before, but it works really well. Fast and simple. I’m glad they included it. One other thing first. 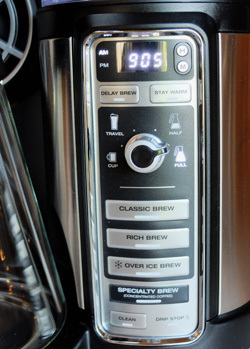 The Ninja Coffee Bar also has an Over Ice setting. 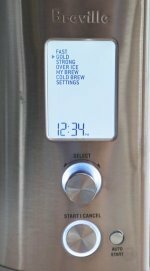 You adjust the dial to the Over Ice setting, put coffee in the filter, fill your cup with ice cubes and press the brew button. With this setting the brewer delivers an extra strong brew so that the melting ice doesn’t dilute the taste. Anyway, back to the big question. 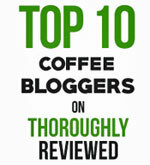 Can the Ninja Coffee Bar replace all your other coffee makers, and our espresso machine? I think it can, most of the time. The basic brewer is great. The single serve function works just fine, albeit with a little more to do than with a Keurig, Tassimo or Nespresso. And the espresso-based drinks function is good too, as long as you can get past the “not real espresso” thing. If you can't find one locally, you can buy the Ninja Coffee Bar through Amazon.com. The Ninja Coffee Bar brewer comes with a coffee scoop and manual milk frother. When making a single cup of coffee, fold down the mug stand to avoid splashing. A single-serve brewer? If so, which one?